‘Don’t fight the Fed,’ has been a convenient way to explain rising prices across the board. It’s even true as far as stocks are concerned, but there are other – even more important markets – that are openly defying QE. Begging the question, when will the hammer hit stocks? It’s not widely publicized, but Bernanke’s QE bazooka has had some spectacular misfires. The only market that’s recovered after every misfire is equities. If you look at the S&P 500 (SNP: ^GSPC) and Dow Jones (DJI: ^DJI) you’ll see about one misfire (at worst a 20% correction) per year followed by a strong recovery. The same ‘medicine’ (or drug) that’s doing wonders for stocks is causing nausea (or hangover) for other asset classes. Which ones? How about gold (NYSEArca: GLD), silver, and long-term Treasuries (NYSEArca: TLT)? 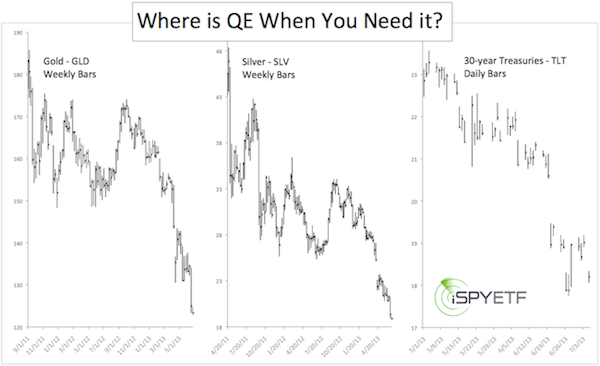 The chart below is a side-by-side demonstration of QE’s failure to launch gold, silver and Treasuries. Charted is the performance of the corresponding ETFs (GLD, SLV and TLT) during their respective crashes. From September 2011 to June 2013 gold prices fell 38.85%. From April 2011 to June 2013 silver lost a stunning 63.42% and the iShares Barclays 20+ Year Treasury ETF (NYSEArca: TLT) is down 22.70%, since its July 2012 high. The Fed was still priming the pump in 2011, 2012 and 2013 and investors were still concerned about inflation. The same forces that drove prices to all-time highs persisted when prices hit an air pocket. The inexplicable happened! Treasury yields – in particular the benchmark 10-year note (Chicago Options: ^TYX) – have a huge economic impact. It’s the financial power horse that carries the economic carriage. That’s why the Federal Reserve has been buying trillions of dollars worth of Treasuries to keep yields down. The 10-year Treasury yield is the highest it’s been in over two years. The inexplicable happened! Why did gold and silver crash? Why are Treasury yields rising and bond prices falling? This common sense analogy comes to mind: Another fix (aka more QE) for a junkie (aka banks) only postpones the inevitable. How long will it be before stocks get hit by the inexplicable inevitable? A stock market ‘event’ may not be too far off. In fact, via a series of recent studies, the Federal Reserve has started the process of officially denying liability and preparing Americans for a possible market crash. This study is the most interesting of all: Surprising New Fed Study – Is it Preparing Americans for a Market Crash? There are times when short-term charts offer little to no guidance, and there are times when a chart just oozes with valuable clues about the market’s whereabouts. The later is true right now. Head-and shoulders, Fibonacci, trend lines, etc., this chart has it all. Sometimes a picture is truly worth more than a thousand words. 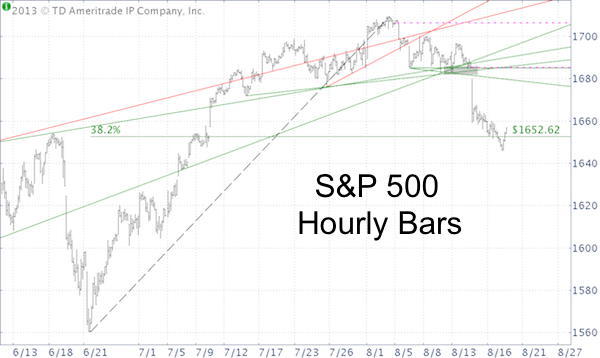 The hourly S&P 500 (SNP: ^GSPC) chart below is jam-packed with interesting clues. 1) There is a head-and shoulders topping pattern with a neckline at 1,681. Several trend lines converging at the same area reinforce the importance of the neckline. The setup was so plain that the August 14 Profit Radar Report recommended to go short with a move below 1,681. 2) The target of a head-and shoulders breakdown is determined as follows: Calculate the difference between the head (1,709) and the neckline (1,681) and project it to the down side (1,652). The head-and shoulders target is 1,652, which the August 15 Profit Radar Report outlined as initial down side target. 3) As the chart shows, 1652 is also the 38.2% Fibonacci retracement of the points gained from June 24 to August 2. 1,652 is thus an important support/resistance level. 4) There are two open chart gaps (dashed pink lines). What happens if the S&P 500 (NYSEArca: SPY) falls and stays below 1,652? It will probably continue south until the next support level. It’s interesting to note that the VIX (Chicago Options: ^VIX) created a similar head-and shoulders formation with an up side target around 15. This up side target was reached as well. The Nasdaq-100 (Nasdaq: QQQ) – buoyed by Apple – could care less about head-and shoulders patterns as it may be worried about its open chart gaps. The S&P 500 (NYSEArca: IVV) is clinging to the 1,652 level. 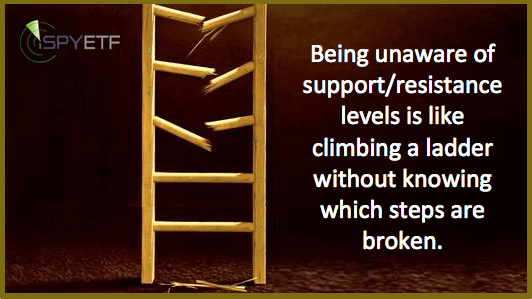 If it fails to hang on, it will drop to the next support level. On the flip side, there are open chart gaps at much higher prices. Sunday’s special Profit Radar Report takes a detailed look at seasonality (both the S&P 500 and VIX), sentiment (8 different sentiment/money flow gauges), technical analysis, and Elliott Wave Theory and visually projects the two most likely paths stocks will take over the coming weeks. Follow him on Twitter @ iSPYETF. A novice wouldn’t be able to distinguish fool’s gold from real gold. Even gold experts have trouble telling the difference. Miners have come up with the acid test to avoid getting fooled. Most metals tend to bubble or fizzle when they come into contact with acid, precious metals don’t. Placing a small drop of a strong acid, such as nitric acid, onto the metals surface quickly and unmistakable differentiates real gold from fool’s gold. Is this gold rally the real deal or is it a fool’s gold rally? The results of this analysis won’t be as conclusive as the acid test for gold (nothing ever is in investing), but there are some worthwhile indicators to consider. The April 28, 2013 Profit Radar Report examined a pattern in the CBOE Gold Volatility Index to ascertain if the April low at 1,321 was here to stay. The CBOE Gold Volatility Index is basically a VIX for gold as the VIX methodology is applied to options on the SPDR Gold Shares (NYSEArca: GLD). 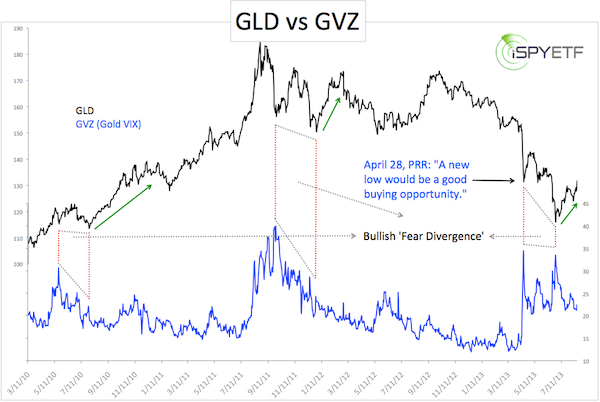 An update chart of GLD plotted against the Gold VIX is shown below. Major gold lows in 2010 and 2011 occurred against positive gold VIX divergences, where gold prices dropped to a new low, but the Gold VIX didn’t. Such divergences are nothing new. I’ve used similar divergences between the S&P 500 (SNP: ^GSPC) and the VIX (Chicago Options: ^VIX) to nail major stock market lows in March 2009, October 2011, and June 2012. See S&P500 Forecasting History for more details. We got that new low on June 28, but it didn’t have all the hallmarks of a lasting bottom. We were long for parts of the rally from the June low, but never committed fully. Our focus was on the iShares Silver Trust (NYSEArca: SLV) where we just closed out a very nice trade. We went long gold again with Thursday’s move above 1,345 (GLD trigger was 130.15). The move above 1,345 is bullish, but gold has already reached your initial up side target around 1,365 (see resistance lines in chart below). If gold can move above resistance here, it is likely to extend its rally and move to our second target. Otherwise watch out. Gold prices have a huge effect on gold miners (NYSEArca: GDX). One unique valuation metric – which correctly predicted the 2001 and 2008 low for mining stocks – just flashed a rare signal. Read more about the Gold Miner’s Signal here: By One Measure Gold Miners Are as Cheap as Ever. Follow him on Twitter @ iSPYETF or sign up for the Free Newsletter. Gold mining is a labor and capital-intensive business. But there are times when investors can make money even in the gold mining sector. That’s either when gold prices soar or when blood is on the streets. Was the June low ‘bloody’ enough to buy gold mining stocks? Gold mining is a tough business. It is capital intensive to wrestle the yellow metal from the ground. Once mined, gold – the most valuable asset on the company’s balance sheet – is sold. Sometimes miners are forced to sell their gold for less than it costs to mine. The miners’ fate often depends on the price of gold. For the novice investor, the price of gold has become unpredictable. During QE1 and QE2, gold (NYSEArca: IAU) and silver (NYSEArca: SLV) soared because investors were afraid of inflation. During QE3 and QE4 investors were still afraid of inflation, but gold and silver tanked. Same circumstances, different outcome. Go figure. Instead the S&P 500 (SNP: ^GSPC) soared. Most of the time the gold mining sector is not the best place if you’re looking for return of capital. But, if you can catch a major bottom (or a gold bull market), even the gold mining sector can pay off big time. The Market Vectors Gold Miners ETF (NYSEArca: GDX) is up 36% since its June low. Is the suffering over for the bruised mining sector? This will largely depend on the price of gold (more below), but first let’s take a look at one unique indicator. The chart below plots the SPDR Gold Shares (NYSEArca: GLD) against the Market Vectors Gold Miners ETF (GDX) and the GDX:GLD ratio. 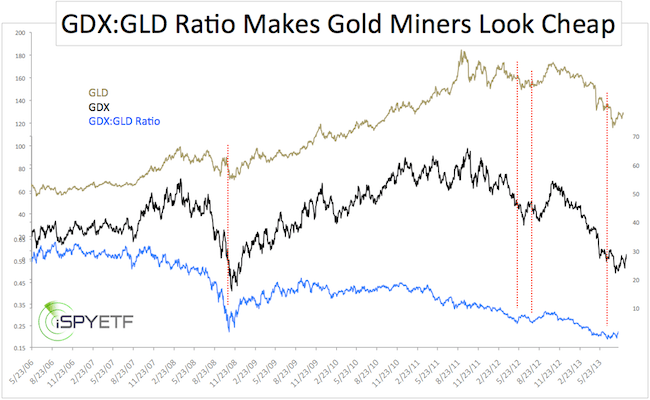 The GDX:GLD ratio basically measures the price of gold stocks compared to the price of gold. When the ratio is high, miners are expensive relative to gold. When the ratio is low, miners are cheap relative to gold. As per this measure, gold miners are cheap now and were ‘major bottom worthy’ cheap a couple of months ago. If you go back further – until 1996, comparing the Gold Bugs Index (NYSEArca: ^HUI) with the price of gold – you will find a lower ratio in 2001, which was when HUI bottomed. So this particular indicator suggests that a major low for gold miners is in. But what about gold prices, the lifeblood of every mining operation? The article Is The Gold Rally Real or ‘Fool’s Gold?’ takes a detailed look at gold prices. 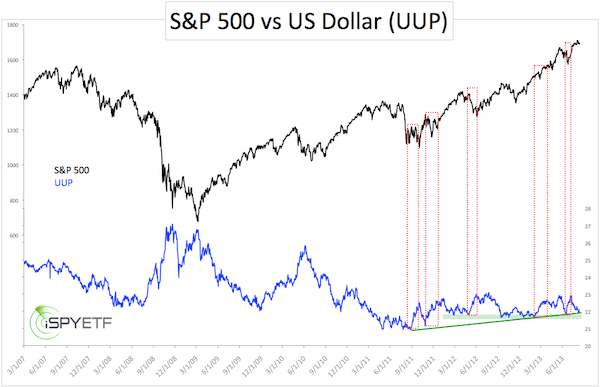 Can The Dollar/Stock Correlation Predict The Next Move? A rising dollar has spelled trouble for stocks for much of the 21st century. Right now the US dollar is sitting right above important long-term support. The odds of a dollar rally are above average. Does that mean lower stock prices? Here’s a detailed look at the correlation between the dollar and stocks. Everybody (including me) is trying to get a handle on the market they follow, but not ‘all roads lead to Rome’ when it comes to market forecasting. Some roads (aka market forecasting approaches) are simply dead ends. Correlations between asset classes and currencies are a legitimate tool to estimate future moves. One of those relationships is the correlation between stocks and the US dollar. Theoretically a falling dollar is good for US stocks. Why? A falling dollar makes US products cheaper in foreign countries, which in turn is good for US profits and stocks. Does the theory hold up in real life? The first chart below plots the S&P 500 against the PowerShares US Dollar Bullish ETF (NYSEArca: UUP), a proxy of the US dollar. Obviously, the correlation is an inverse one and somewhat difficult for the untrained eye to detect. The second chart plots the S&P 500 (NYSEArca: SPY) against an inverted UUP. This makes the correlation a bit more apparent. 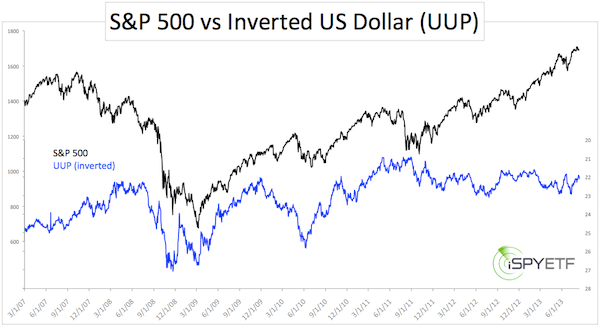 In fact, comparing the S&P 500 (NYSEArca: IVV) to the inverse dollar is almost like comparing it to the euro (NYSEArca: FXE). The correlation held up for much of July 2008 to November 2011. What happened in November 2011? Operation Twist was reintroduced, but I’m not sure if that’s enough to upset the correlation. Regardless of the cause, since November 2011 investors haven’t been able to count on the US dollar/stock correlation to predict future moves for either stocks or the dollar. Still, it is interesting to note that the dollar is close to important long-term support with above average odds of rallying from here. The red boxes in the first chart shows that recent dollar rallies usually turned into speed bumps for stocks. So, there’s reason in not ignoring the dollars effect on stocks entirely. Could a Strengthening Dollar Sink Stocks? On a walk down memory lane, we discover bold statements like this one – “Nobody wants toxic US dollar” – made in April 2011. Today the dollar trades 8% higher. In fact, the dollar is right above key support. Will it hold and potentially sink stocks? But nearly five years later, the greenback is holding its ground. It may not be the strongest currency of the global currency basket, but the US dollar today – and that may be hard to believe – is trading exactly where it was back in 2004 (dashed purple line). Albeit choppy, since August 2011 the dollar has consistently climbed from higher lows to higher highs. Connecting the recent lows creates obvious support (green trend line). The US Dollar Index came within striking distance of this trend line last week. A trend line is called a trend line because it delineates a trend. In this case an up trend. The trend remains up as long as price stays above the trend line. 2) Dollar strength or weakness is not just a currency story; it’s also an equity event. There is a correlation (see below) between movements of the US dollar and stocks. A US dollar rally may lead to falling stocks. Why? A falling dollar is good for exports and corporate profits and therefore good for broad US indexes like the S&P 500 (SNP: ^GSPC). A rising dollar is generally bad for corporate US profits. Based on my assessment, the odds of a sustained dollar rally are currently greater than the odds for a decline. The PowerShares DB US Dollar ETF (NYSEArca: UUP) provides long US dollar exposure. If support fails, it may be time to look at the PowerShares DB US Dollar Bearish ETF (NYSEArca: UDN) or CurrencyShares Euro Trust (NYSEArca: FXE). Exactly how strong is the correlation between stocks and the S&P 500 (NYSEArca: SPY)? 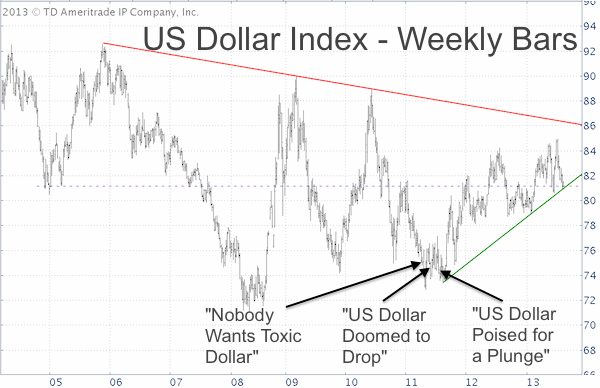 Could a US dollar rally sink stocks? This article about the US Dollar/Stock Correlation shows exactly what a strengthening dollar would mean for US stocks. Surprising New Fed Study – Is it Preparing Americans for a Market Crash? The latest study by the Federal Reserve Bank of San Francisco (FRBSF) draws unexpected conclusions that almost make you believe a disgruntled Fed employee did it. But be assured, it’s an official study published on the FRBSF website. The Federal Reserve study analyzes and quantifies the effect of large-scale asset purchases (LSAPs), also known as quantitative easing (QE) and lower interest rates, on the economy and inflation. The results are uncharacteristically frank and seemingly self-defeating, but the intent of this study may just be brilliant (more below). The study is about 5 pages long and can be summarized roughly by a few paragraphs. In other words, QE only works in conjunction with a low interest rate policy. The federal funds rate, the rate banks charge each other to borrow money deposited at the Fed, is already near zero. The 10-year Treasury yield (Chicago Options: ^TNX) is just coming off an all-time low. It is no longer possible to ‘supercharge’ QE with ZIRP. A few days ago, the Federal Reserve came out with a report stating that leveraged ETFs may sink the market. View related article about leveraged ETFs at fault for market crash here. This is ironic, because even the Geico caveman knows that various QEs buoyed the S&P 500 (SNP: ^GSPC) and Dow Jones (DJI: ^DJI) to new all-time highs. Even economically sensitive sectors like consumer discretionary (NYSEArca: XLY) trade in never before seen spheres. Did the Federal Reserve ever admit to manipulating the stock market higher? Sometimes in cryptic terms without any direct admission of guilt, but there is one exception. An official report by the Federal Reserve of New York actually puts a shocking number on how much above fair value the Fed’s QE drove the S&P 500.